After a sold our run at Dublin Fringe Festival last September, and with an overwhelming demand for a remount, Liz Roche Company returns with Näher….closer, nearer, sooner next month. 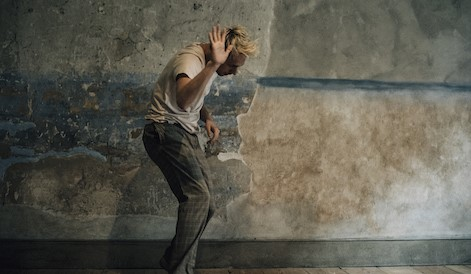 This multi-disciplinary dance show was originally created to showcase the Goethe-Institut’s newly refurbished buildings, situated on one of Dublin’s grandest Georgian addresses, Merrion Square. Roche gathers again the same world-class team of collaborators, to create this magnificent site-specific dance piece, where audiences are taken on a thrilling dance odyssey, through one of the Dublin’s most exquisite postal addresses. The show brings the audience to experiential encounters, emotions, and movements, in this acclaimed work by choreographer, Liz Roche, who in 2018 has carved a defined work-style, after staging many exemplary new works in stunning locations in Ireland, this past year. Within these new and old walls at Goethe-Institut Irland are layers of stories and memories. This not-to-be-missed dance encounter brings up all of the emotions and movements that bring us closer. Encouraging us to share in an intimate living room play, and to live the best moment of our lives are Liz Roche and her company, along with prolific theatre-maker and playwright, Shane O’Reilly, who co-devised the piece. Collaborating with Berlin-based sound designer, Roy Carroll, and costume designer, Catherine Fay, working with performers that include Finola Cronin, Henry Montes, Anne-Laure Dogot, and Kevin Coquelard, alongside a secondary cast of young dancers and actors from different youth groups, including Dublin Youth Dance Company. Liz Roche and her company will explore the concept of ‘the best moment in your life’. The idea of longing for and yearning for a period in one’s past that was golden, removed from the normal everyday life. CAST: Finola Cronin, Henry Montes, Anne-Laure Dogot and Kevin Coquelard – plus senior dancers from the Dublin Youth Dance Company.